Originally planned as a nine-story, 100-room luxury hotel, the Dewberry Hotel, formerly The Landmark Hotel, is a vacant partially constructed building on the Downtown Mall. Construction was abandoned in January 2009. The newest owner, Dewberry Capital of Atlanta, submitted design plans to resume construction and expanding the number of rooms to 112. 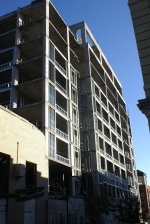 Located at 201 East Water Street, the reinforced concrete structure remains incomplete - lacking windows, elevators, balcony railings and most basic services. However, the project remains in limbo as the tenth anniversary of the end of construction approaches. In July of 2016, the Charleston’s Dewberry hotel opened. The eight-story, 155-room property opened in a former federal office building in downtown Charleston, NC. The Landmark was the creation of entrepreneur Lee Danielson. The idea was to build a $30 million, nine-story luxury boutique hotel. The Charlottesville Board of Architectural Review approved construction plans on February 20, 2008. BAR granted conditional permission to tear down the black granite façade in October 2008. Because of a quirk in Virginia law these original 2008 approvals remain in effect, and stay valid until 2017. Minor fired developer Lee Danielson in December 2008. Construction stopped in January of 2009. The pair went to court. The welter of lawsuits that followed the collapse of the project included a Federal Deposit Insurance Corporation ("FDIC") suit against Silverton Bank (which the FDIC was forced to take over and later dissolve), and another FDIC lawsuit against Minor for having defaulted on a $10.5 million Silverton loan. Donald H. Kent of Richmond-based arbitration firm The McCammon Group ruled that Danielson misrepresented the construction costs–- including hiding the fact that the restaurant wasn't included in the budget. The arbitrator awarded $4.2 million in damages, and attorney's fees of $2.24 million. On September 1, 2010, Minor filed for Chapter 11 bankruptcy. The filing stayed all pending lawsuits which by then included the suit between Danielson and Minor, the FDIC lawsuit against Minor, and lawsuits against Minor filed by Merrill Lynch, Sotheby's, and Christies. On June 18, 2012, three companies bid on the property. They were Deerfield Square Associates, J.B. McKimmon and TRT Holdings, Inc.  Each submitted an opening bid of at least $3 million and a $200,000 cash deposit. Danielson submitted a bid but he was rejected because of an inability to guarantee to pay. After nearly four years of being abandoned, Charlottesville officials served Dewberry in the fall of 2013 with a letter requesting he secure the property against vandalism and grafitti. Dewberry responded by saying he had done enough. January 19, 2016: Council directs staff to prepare for legal action to either force construction or to force public acquisition through eminent domain. ↑ Web. Dewberry plans for Landmark hotel to go before review panel, Sean Tubbs, News Article, Charlottesville Tomorrow, June 3, 2017, retrieved June 9, 2017. ↑ 2.0 2.1 Web. Dewberry Capital Wins Landmark Hotel for $6.25 M, Matt Telhelm, NBC29 News, June 18, 2012, retrieved June 18, 2012. ↑ Web. Atlanta developer snaps up Landmark for $6.25 million, Graelyn Brashear, C-VILLE Weekly, Portico Publications, retrieved February 18, 2016. ↑ Web. Charleston’s Dewberry Hotel rolls out more rooms, Dave Munday, Charleston Post and Courier, September 4, 2016, retrieved September 5, 2016. ↑ Web. Dewberry more: Charleston, SC’s new hotel superstar, Christian Gollayan, News Article, New York Post, June 26, 2018, retrieved December 30, 2018. ↑ Web. Status of the L. Mendel Rivers Federal Building Exchange, General Accounting Office, June 26, 2003, retrieved December 30, 2018. ↑ Web. Developer buys Mendel Rivers, John McDermott, News Article, Charleston Post and Courier, Charleston, South Carolina, January 21, 2008, retrieved December 30, 2018. ↑ Web. The Dewberry Charleston by StudioDewberry/Reggie Gibson Architects, Beth Broome, News Article, Architectural Record, April 1, 2018, retrieved December 30, 2018. ↑ Web. cc51a.html Council requests action plan on Landmark from city manager, Chris Suarez, Daily Progress, World Media Enterprises, January 20, 2016, retrieved February 18, 2016. ↑ Web. City Council Passes Resolution Regarding Landmark Hotel Property, Press Release, City of Charlottesville, retrieved December 27, 2016. ↑ 13.0 13.1 Web. Design panel approves additional height for Dewberry Hotel, Sean Tubbs, News Article, Charlottesville Tomorrow, March 23, 2018, retrieved April 4, 2018. ↑ Web. City faces limited options as Dewberry project progress stagnant, Nolan Stout, Daily Progress, World Media Enterprises, October 13, 2018, retrieved October 30, 2018. ↑ 15.0 15.1 Danielson, Minor break ground on ‘Landmark’ Dave McNair, The Hook, March 11 2008, retrieved 26 Aug 2009. ↑ 16.0 16.1 ONARCHITECTURE- Bright idea: Danielson's Beacon's back in town, Dave McNair, The Hook, March 1, 2007, retrieved 26 Aug 2009. ↑ In response to the 2008-09 recession when construction financing suddenly dried up, developers persuaded the Virginia legislature to extend all existing plat and plan approvals until 2017. ↑ New Details about New Luxury Hotel, Joanna Shrewsbury, NBC 29, March 11 2008, retrieved 26 Aug 2009. ↑ Landmark letdown: Hotel project’s lender folds, Lindsay Barnes, The Hook, May 1 2009, retrieved 26 Aug 2009. ↑ Landmark Hotel developer fired Brian McNeill, Daily Progress, December 6, 2008, retrieved 26 Aug 2009. ↑ Web. FDIC sues bank that financed Landmark Hotel - C-VILLE WeeklyC-VILLE Weekly, Chiara Canzi, August 24, 2011, retrieved October 25, 2015. ↑ Web. Landmark showdown: Minor, Danielson begin court fight, Lindsay Barnes III, March 13, 21009, retrieved October 25, 2015. ↑ 27.0 27.1 Web. Minor: 'Travesty of justice' on Landmark ruling, Daily Progress, World Media Enterprises, January 21, 2011, retrieved January 24, 2011. ↑ Web. http://www2.dailyprogress.com/business/2011/dec/07/judge-prioritizes-minors-landmark-debts-ar-1527954/, Samantha Koon, Daily Progress, World Media Enterprises, December 7, 2011, retrieved December 8, 2011. ↑ Web. Three bidders for Landmark Hotel emerge, Samantha Koon, Daily Progress, World Media Enterprises, June 14, 2012, retrieved June 15, 2012. ↑ Web. Developer Dewberry fires back over city's demands to secure former Landmark siteC-VILLE Weekly, Graelyn Brashear, Ocotber 30, 2013, retrieved October 24, 2015. ↑ 31.0 31.1 Web. Charlottesville officials set Planning Commission date on Landmark, Staff reports, Daily Progress, World Media Enterprises, December 5, 2013, retrieved December 6, 2013. ↑ Web. The Fat Radish's Ben Towill will develop new hotel restaurant, Kinsey Gidick, Charleston City Paper, April 13, 2015, retrieved April 14, 2015. ↑ Web. Ryan Casey Joins The Dewberry and Other New Details on the Upcoming Hotel [Updated], Erin Perkins, November 13, 2015, retrieved November 16, 2015. ↑ Web. Landmark’s last stand? More security, structural reports called for, Graelyn Brashear, C-VILLE Weekly, Portico Publications, January 22, 2014, retrieved January 22, 2013. Print. January 22, 2014 . ↑ Web. Construction on Landmark Hotel might not resume till 2016 - The Daily Progress: Local, Chris Suarez, April 18, 2105, retrieved October 24, 2015. ↑ Web. Mall rats: Does the Downtown Mall have a rodent problem? This page was last edited on 11 January 2019, at 01:31.